With the release of Ab3d.Reader3ds v7.0 and Ab3d.PowerToys v2.0 a new milestone in 3D programming was reached. The first version of WPF brought us simplified programming with 3D. With WPF there is no need any more to deal with C++, DirectX and graphics drivers. 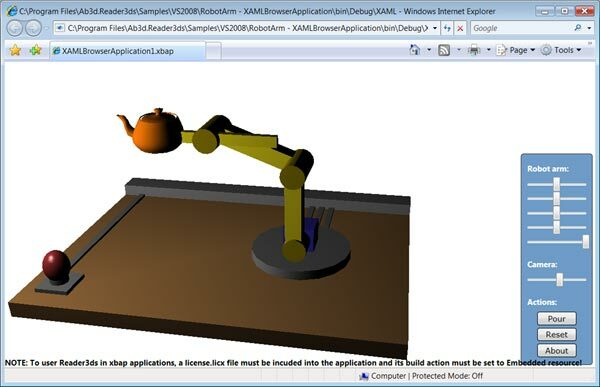 Now programmers can use xaml and managed code to define the 3D scene. Besides this WPF can use high end graphic cards when they are available and can fallback to software rendering when the computer does not have an accelerated graphics. Of course WPF does not provide all the features of DirectX, so it is not capable of running high end 3D games. But my customers have already proven that it is very capable of showing very complex 3D scenes with models with several hundred thousands triangles. But WPF still lacks many features to make programming with 3D easy. 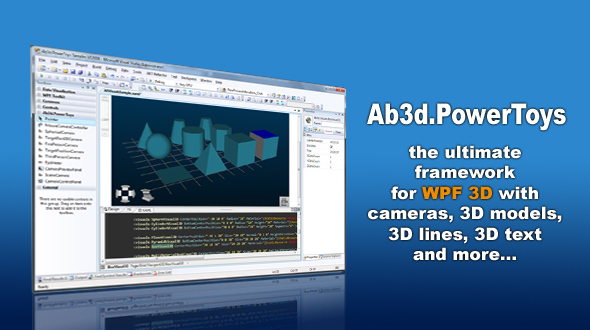 Now with Ab3d.Reader3ds and Ab3d.PowerToys users have the ultimate framework to work with WPF 3D. The Ab3d.PowerToys includes advanced cameras, camera controllers (rotate and move the camera with the mouse, etc. 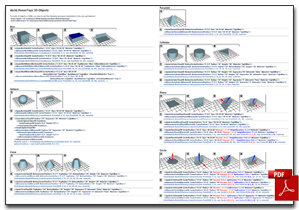 ), 3D objects (Box, Sphere, Cone, etc. 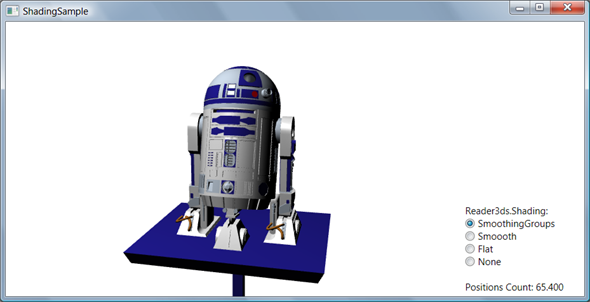 ), 3D lines, 3D text and classes to simplify using mouse events on 3D objects. With Ab3d.Reader3ds and Viewer3ds it is possible to define 3D models in almost any 3D modeling application (3D Studio Max, Maya, AutoCad, etc. ), save the objects into 3ds file and use the 3D models in your WPF application. That was a short overview. Now to the details about the libraries and more information about new features. The new version of Viewer3ds application (3ds to xaml converter) that comes with Ab3d.Reader3ds library brings many new improvements. The application is now using the Ab3d.PowerToys library. Therefore it was really easy to add camera rotation and movement. Among other changes I would also like to mention the new possibility to get detailed information about selected objects (sizes, materials, detailed mesh information, etc.). The Ab3d.Reader3ds library also got many improvements. The biggest enhancement is great performance improvement - because of optimized algorithm and multi-threaded processing some 3ds files are read 80% faster. But reading some very large 3ds files can still take a few seconds. To improve user experiance it is now possible to get progress reports while reading the file. The samples that came with the library demonstrate how to show progress window on another thread or read the 3ds file on another thread and show the progress on the main thread. Improved handling of texture files with simplified notifications about missing texture files. Added GetXaml method to Reader3ds class to get formatted xaml text of the read 3ds file. Improved reading FiledOfView and SpecularMaterials. Improved support for running in partially trusted environment. Complete list of changes can be seen here. I am really proud of the features and capabilities the Ab3d.PowerToys library. They really bring WPF 3D to a completely new level. The library makes Visual Studio a simple 3D modeling application as all the 3D objects and cameras that are defined in xaml are immediately seen in designer window. This way it is very easy to arrange the objects, set camera or otherwise define the scene. The previous version of Ab3d.PowerToys already included many basic 3D objects (Box, Sphere, Cone, etc), 3D Lines and simplified mouse event handling on 3D objects. Added support for 3D text. Improved PolyLines - they are now correctly connected to each other. Added MultiMaterialBox where each side of the box can have its own material. Added CreateFrom method to all Ab3d.Cameras - it can be used to create any Ab3d.Camera from existing WPF's Camera (or camera read from 3ds file with Ab3d.Reader3ds). Added CameraAxisPanel - a predefined panel that shows the axis orientation for the target camera. Added RectangleVisual3D, WireBoxVisual3, WireCrossVisual3D, VerticalPlaneVisual3D and LineArcVisual3D. Added IsVisible property to all 3D models derived from Visual3D. Added CreateWireframe method that takes Model3D to create wireframe from Model3DGroup or GeometryModel3D. Fixed for using in partially trusted environment - before creating custom cursor was not allowed - now a Hand cursor is used instead. BREAKING CHANGE: Fixed Bank - now the positive bank values rotate the camera in the clockwise direction (before the direction was counter-clockwise). For example bank angle 30 means that the Camera is rotated as a head would be bended to the right. The complete list of changes is really long - it can be seen on Abd3.PowerToys web page. To see more screenshots and details about the library see Abd3.PowerToys web page. Ab3d.Reader3ds and Ab3d.PowerToys are separate products, but when the Ab3d.Reader3ds pro library license is purchased, the price for Ab3d.PowerToys library is ONLY 1 USD. I am already planning to add a few new exciting features to the library. If you have any recommendation and other comments you are most welcome to post them to the library’s forum. As usual the new version can be downloaded from User Account page (for commercial users) or from my Downloads page (for evaluation version). PS: For the customers of Ab3d.Reader3ds with expired updates subscription I am preparing a very special offer to renew the subscription – detailed information will be sent to your email in the following days. A new version of Ab3d.Reader3ds is available! And it adds great support for showing 3D objects from 3ds file with using only XAML. By the way, for those who do not know what 3ds is: 3ds is the most commonly used file format for storing 3D content. 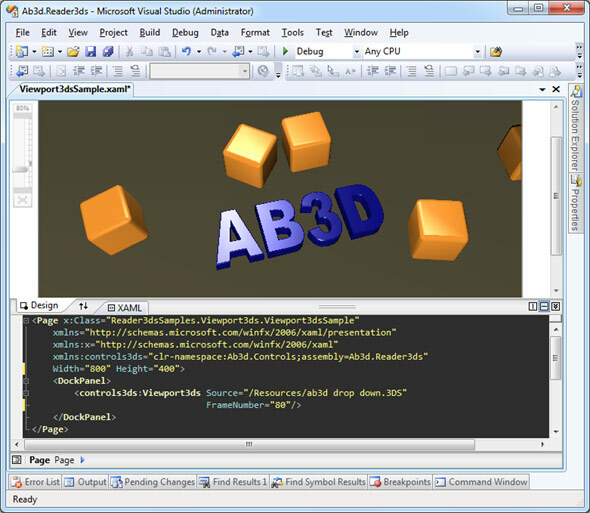 And Ab3d.Reader3ds is the library that enables you to bring all the 3D models stored in 3ds into the WPF's 3D world. The image shows that with only one control it is now possible to show 3D models from 3ds file. And it is also possible to see the preview in Visual Studio Designer. So you only need to set the IsAnimated property to true and the animation stored in 3ds file will be played automatically. It is also possible to set some other animation properties - in our example AutoRepeat and AnimaitonDuration. This way it has become really easy to include animated 3D content inside WPF applications. The Viewport3ds is just the most basic way to show the objects from 3ds files. For more advanced users it is now possible to use Model3ds and even Reader3ds in XAML. This was just a simple sample of Model3ds. For more check out the samples that come with the Ab3d.Reader3ds library. The sample shown that because Reader3ds is defined as Page's Resource, it can be used in databinding. In the sample above the Content of the ModelVisual3D and the Viewport3D's Camera are databound to the Reader3d. And this is not all - it is also possible to bind to the Reader3ds NamedObjects dictionary, to Materials dictionary, Cameras list, etc. (see samples with library for more). As I have already mentioned, the new XAML support is not the only improvement of the Reader3ds. The 3ds reading engine has been also improved. Now all the known problems from my very big list of 3ds files (collected with your help also) have been solved. I have finally managed to find a way to correctly read some 3d objects that were defined with using left-handed coordinate system instead of right-handed one (usually mirrored objects). Texture mapping is also improved (before some Textures were not placed correctly - in this version I have added DisableTextureOffset property - by default it is true to fix the problems). Fixed "Object reference not set ..." exception when reading some 3ds files. Also added support for textures in tif file format. So now if it looks like Reader3ds or Viewer3ds did not correctly read the 3ds file, please try to open the 3ds file in a 3D modeling application. In almost all the cases the problem is in the 3ds file and not in the Reader3ds. Usually the 3ds file was not correctly exported - probably because you used some advanced features like bones animations, but 3ds file is quite old and cannot store those data. I know, many of you are waiting for some other 3D file format readers - I will make some in the next year for sure. All of the features of the Ab3d.Reader3ds library still work on .Net Framework 3.0. For performance reasons it is highly recommended that you use .Net 3.5 SP1, but if you develop for .Net 3.0 you still can. But probably the next version will alredy require the 3.5 SP1. After reading about all the new features, I am sure you agree that the Reader3ds deserved the increase of the version from 5.3 to 6.0. I also hope that you agree that programming with 3D was never easier! As always the new version can be downloaded from my Downloads page. As promised I have published a source code for Animated 3D buttons that were used in previous version of Viewer3ds. The sample shows how to create 3D buttons that are animated when mouse moves over them. Under the buttons there is a nice reflection of the buttons. The models for the buttons are defined in 3ds files and read with Ab3d.Reader3ds. The sample is now part of the samples that come with Reader3ds installation. It is also possible to download the sample alone from here (note that Ab3d.Reader3ds have to be installed on the system). The previous version or Ab3d.Reader3ds did not work with WPF Browser applications (XBAP). Because WPF Browser applications are running inside a partially trusted environment, the licensing code could not read the license or evaluation information. The new version overcomes this by embedding the information into the applications resources. To do this a license.licx file needs to be added to WPF Browser application's project and its build action should be set to Embedded resource (also for evaluation version). 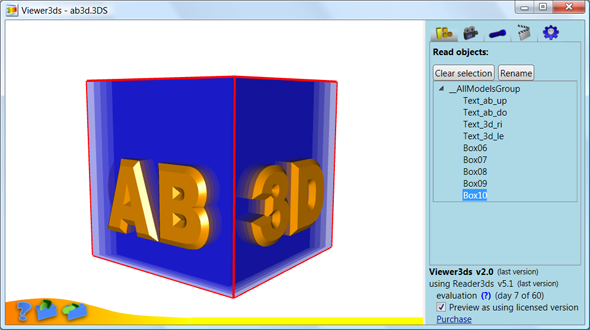 Added support for using Ab3d.Reader3ds in WPF Browser applications (partially trusted). Fixed problems with evaluation version with SmoothingGroups - sometimes "Index was out of range. Must be non-negative and less than the size of the collection." was thrown. Fixed reading some 3ds files with animation - sometimes "System.OutOfMemoryException" was thrown. For convenience I have also included samples for VS 2008 into the installer (besides VS 2008 solution). The new version is available on https://www.ab4d.com/Downloads.aspx. There is never enough testing! Everyone who has already tried the new version of Viewer3ds knows what I mean. The application just did not start! During the final testing a wrong version of Viewer3ds "smuggled" into my installer project. Because I have already done extensive Viewer3ds testing, I did not test it again. What a mistake! The installer contained a version of Viewer3ds that required a wrong version of Reader3ds. Luckily the new Viewer3ds has an error reporting system, so I could act quickly. The fixed version is already available on https://www.ab4d.com/Viewer3ds.aspx. It was actually already available on 31th December 2008, but because of a New Year celebration I did not have time to write a message about it. I must admit that the past few releases were not very good. Every release had some problems. I am already using a unit testing, but still there is place for error. I was also quite under pressure, because I have to release new versions for all the products before the previous version expired. With the releases still to come I will have more time for additional testing. So they should be less buggy. Finally my firstly published application, Viewer3ds, got a major update. The Ab3d.Reader3ds library was also updated. The previous version of Viewer3ds was really old. More than 2 years old! The main problem with Viewer3ds was that it was using an embedded Ab3d.Reader3ds library for importing 3ds file. This meant that the updates of Ab3d.Reader3ds and many new features that were introduced did not have any effect on the Viewer3ds. The new version of Viewer3ds does not have an embedded Reader3ds, so the currently available version is used. The objects hierarchy is displayed in a tree view. It displays names of the objects that were defined in a 3D modeling applications. So when the exported xaml is used in your application, you can know which names to use to access the objects. All the 3D objects can be renamed (or given a name if a name was not specified). If the 3ds file contains an animation, it can be played with Viewer3ds. A selected frame can be exported to xaml. It is possible to export only selected objects (besides exporting all objects). Camera can be freely rotated around the read objects (select Free Camera in Cameras Panel). Lights can be turned on and off. A camera light that shines in the direction of the camera can be added to the scene (in case the scene does not contain any light). There are many options on how to load the 3ds file. For example it is possible to disable transparencies, control the shading of objects, etc. Some of you will probably miss the 3D buttons that were used in the old Viewer3ds. No need to worry. I am going to prepare a sample with the same 3D buttons. It will be available with full source code so you could add the same functionality to your applications. Fixed bug when reading spot lights. Fixed Null reference exception when setting Default Material. When applying smoothing groups or smooth shading, the texture coordinates are also remapped (before textures were not applied correctly). Using new licensing model with improved evaluation. The new version has no fixed expiration date - instead library can be installed for a 60 days evaluation. The new version is available from https://www.ab4d.com/Viewer3ds.aspx. As promised the commercial version of Ab3d.Reader3ds is available. The purchase can be done on https://www.ab4d.com/Purchase.aspx. As rss subscriber I give you 10% launch discount. Just enter "Reader3dsRss" as a discount code on the Purchase page. The discount is valid only until the end of July 2008.